Christians woke up on February 14, 2018, believing the clash between the Hallmark calendar and the liturgical calendar was a crisis. And then, before our eyes, a real crisis happened. Again. This time, in Parkland, Florida. Valentine’s Day. Ash Wednesday. School shooting. I received a small handful of emails and texts, and one phone call from youth ministers who had the wisdom to recalibrate their usual Wednesday night activities. The refrain was the same: “We were going to do [insert planned event], but we need to change our plans,” they said. “Are there any resources for worship with teenagers when things like this happen?” another asked. With only a few hours before teenagers came in the doors, these leaders were turning to Christian worship in a moment of crisis and tragedy. On February 13, the day before chocolates, ashes, and guns, a colleague shared his most recent writing, “Terrorism and the Politics of Worship.” It’s not an easy read, but the point is summed up in these words by ethicist Stanley Hauerwas, "Bad liturgy eventually leads to bad ethics. 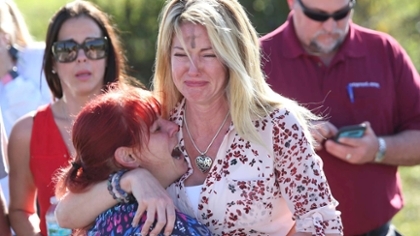 You begin by singing some sappy, sentimental hymn, then you pray some pointless prayer, and the next thing you know you have murdered your best friend.” As I began thinking about the requests I received from church leaders, I returned to the article from my colleague, troubled with questions like these: Do our worship practices have something to do with the tragedy in Parkland? Can public Christian worship prevent tragedies like the one in Parkland? I haven’t answered those questions fully for myself. My idealist self is optimistic, but my realistic self is more pessimistic than I am willing to admit. In the last two days, I’ve found myself asking these two questions: Can our worship gatherings help teenagers process the tragedy in Parkland? Can the songs we sing and the prayers we pray form our teenagers to know how to respond when tragedies like this occur? Yes, they can, and frankly, they must. While adults are debating gun control and mass shootings on a macro-level, we too-often fail to place ourselves in the shoes of those teenagers among us. Could it be that teenagers are one of the most vulnerable age groups in these senseless tragedies? If so, we must help them process these tragedies. Are teenagers hard-wired more than any other age group to feel a sense of emotion, connectedness, and empathy for their peers in Parkland? If so, worship must help them know how to respond when tragedy strikes. Sandy Hook elementary children and brave adult teachers not withstanding, could the greatest number of deaths from school shootings since Columbine have been individuals between the ages of 13-19? As sobering as it is, the church must find safe spaces to help teenagers encounter situations of life and death. Preparing Teenagers for Encounters with Life and Death. This won’t be comfortable to think about as an adult. This isn’t easy to explain to teenagers. This shouldn’t be easy to implement. But, sometimes the most difficult of situations and tasks are also the most necessary. If you’re a church leader working with teenagers, here are six ways worship might help the teens in your midst reflect on the events in Parkland, respond to the events in Parkland, and prepare for other situations when teenagers are faced with life and death. 1. Create a safe space. Remember, nothing about this is easy. If this is the first or fiftieth time you’re addressing a tragedy or crisis through worship, it’s not normal. Use a familiar environment. Ease into the topic with worship elements that are known or comfortable to your teenagers. 2. Sing and use the Arts. Sometimes, words just aren’t enough. It’s amazing how music and the whole repertoire of the arts can create community by getting us out of our individual thoughts. Use images, poetry, and other forms of prayer. 3. Pray with the full repertoire of the Psalms. The Psalter is a resource of praise, but also of lament, confession, dedication, and so many other expressions that are deeply needed in times such as these. Use the Psalms to shape your prayers. 4. Replace teaching with small group conversation. While there are times for preaching to teenagers, there are also times for asking questions to hear how teens are reflecting, processing, and responding to current events. Consider replacing a usual message or sermon with small group conversations led by adults or older teenagers to ask poignant questions. 5. Provide opportunities for teenagers to act. Acting on our thoughts and beliefs after careful prayer is part of our Christian vocation. Help teenagers find ways to make a difference in their city, nation, and world as a result of worship. 6. Follow up. If you engage tragedy in worship with teenagers, don’t do it the first time you’re together after Parkland then check it off your list. Bring it up the next time you meet. And, the next time. And, the next time. Chocolates, ashes, and guns. They don’t go together. They shouldn’t go together. But, on February 14, 2018, in the United States, they did go together, and we must respond for the sake of our teenagers. May we help them learn to love well. May we help them learn to confess and lament. May we help them move forward for their sake, and ours.